Brief heart animation over the Dread Hatchling's head when the player summons the Raven Lord mount or Dread Raven mount. Warlords of Draenor Collector's Edition required. This pet is a free gift for purchasing the Warlords of Draenor Collector's Edition or the Warlords of Draenor Digital Deluxe. The Collector's Edition was sold in stores (in limited quantity). In the Battle for Azeroth prepatch, her base stats as of Battle Pet BreedID have been changed by 0/-1,5/+1,5 – from 8,125/8,375/7,5 to 8,125/6,875/9. Such a big discrepancy between baseline power and the other baseline stats has made her a first pet whose stat promoted by pure breed (P/P) is not the highest one. A personal favorite. This lil guy packs a mean punch with his Call Darkness and Nocturnal Strike combo. Plus, he's a little cutie! I can't believe he isn't ranked higher. Received my Dread Hatchling from the WoD Collector's Edition. This pet is highly underrated and should be ranked much higher. It completely steamrolls Aquatic pets and Call Darkness is efficient vs Aquatics due to many of them having a healing ability. Dread Hatchling is my go-to pet for many pet battles. Blizzard did bring it back to the Battle.Net store for a limited time, but it's no longer there. I would highly recommend taking advantage of getting it if it becomes available again. Available on Blizzard Shop again. Limited stock. I rush for buy my collectors edition and Im very glad for this pet and the amazing mount. Besides that, the pet interact with the mout when are summoned! And is a great pet for PvE Battles! Another favorite to battle with! Did they make Shadow Talon a Magic ability (from Flying) in a recent patch?? (Or has it just been too long since I've leveled pets?) I feel like I remember this baby having a way harder-hitting first ability that would just two-shot wild Aquatics. I personally like using him with anzu's blessing over nocturnal strike because that makes the spammable and very hard hitting shadow talon to always hit, even with darkness, which also makes him nicely different from crow/raven. Honestly this pet is amazing, he should have a much higher rating. Using Call Darkness and Nocturnal Strike kills most things, occasionally need to mop up with Peck, then you're done. Having such a powerful bird with the Consume ability is quite wonderful for PVP battles. Anzu's Blessing will offer a tiny negation to Blind. It has won many battles for me. I have even used Consume to soak up minefield as Tonks tend to be really slow. 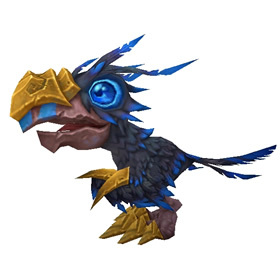 I think this lil' guy is awesome, at least in PvE battles vs anything aquatic, equally deadly as crow/raven. When idle for a time [for example, while fishing] he will preen under his wing in a very cute awkward fashion. He's a delight to have around. A nasty little hatchling with a powerful arsenal that is going to take a lot of beating in pet battles! This guy is a serious asset for levelling pets in the Vale! Most of the pets are aquatic with a few flying, so you'll often get an entire battle of aquatic battlepets, and you can storm through them. Shadow Talon then Call Darkness to take the first out. Then straight into Nocturnal Strike and most of the time it'll take the next one out in one shot. Then just Shadow Talon a couple of times and you're done! He's also really good for assisting with Grand Master Aki along with Anu Idol! You should read the next paragraph right after the paragraph you apparently read on the main page...>_>; It specifically says how to add it, right down to the exact page. How do I mark this pet as collected? Main page stated that it can't be imported from armory. i have this pet leggaly promose and this site only says want it or exclude it.